Sales certificate recipients pose with faculty for a group photo after the awards ceremony. Skarley Gonzalez, a senior business administration major from Omaha, Nebraska, started her college career without a definite career plan. After taking the Sales Communication (MRKT 257) class, she gained inspiration to enroll in the sales program. She quickly learned how to sell, including selling herself. Skarley Gonzalez talks with fellow sales certificate recipients before the awards ceremony. She credited Chad Marseden, assistant professor of practice in marketing, and Laura McLeod, assistant professor of practice in marketing, with mentoring her along the way. Sales role-playing activities put Gonzalez in the position of negotiating with classmates. “At first I thought I’d do terrible. Then I went in and nailed it. They record us so we can watch ourselves selling later. I never saw myself look so confident and comfortable than when I watched myself selling. At that point, I knew the sales program was for me,” she said. Kyle Benesch, a senior marketing major from Columbus, Nebraska, took a different route to the program. On his 24th birthday, Benesch, who felt he was in a dead end job, made a visit to the Business Advising and Student Engagement office to see an academic advisor. He completed some college but needed new direction for scholastic opportunities and career goals. The program allowed Benesch to make connections he otherwise would not have had. He represented Nebraska at the International Collegiate Sales Competition in Orlando, and credits the sales faculty with his new employment. Dr. Kathy Farrell presents Kyle Benesch with his sales certificate during the awards ceremony. “They helped me make awesome connections which led to an internship and full-time position at NRC Health. I’ll be hitting the ground running when I start my new position before graduation in May. Without the sales program it would not have been possible,” he said. Dr. Ravi Sohi, executive director of the Center for Sales Excellence, professor and Robert D. Hayes Distinguished Chair of Sales Excellence, sees the students receiving their certificates as important to the growth of the program. “Over the past four years, we have admitted more than 200 students into the program and its popularity has grown. A lot of the growth is word-of-mouth. We originally wanted to admit 25 students per semester, but we’ve had so many good applications, we’ve ended up admitting 35 or more. Students receiving their certificates today are now our ambassadors to show others around campus what you can do with a sales certificate in professional selling,” said Sohi. Dr. Kathy Farrell, James Jr. and Susan Stuart Endowed Dean of the College of Business, presented students with that certificates at the ceremony. She endorsed the value of the certificate to all Nebraska students. “The sales certificate is important regardless of your major. It doesn’t matter what you do, you’re going to be selling. 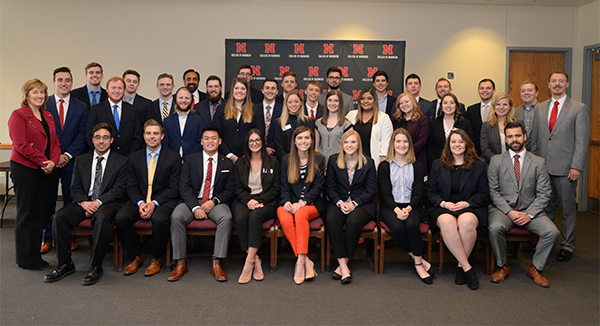 The sales certificate is a great addition to a student’s personal portfolio, and through the sales program you learn to present yourself better than when you started the program,” said Farrell.